Running for Weight Loss? Run This Way! A few lot of pounds too heavy? You want to lose weight? You consider running for weight loss? The sensible answer is: No. If you want to succesfully lose weight through running, 1) you have to find it doable and fun, as opposed to hard and boring, so you want to continue, and 2) your body has to be able to tolerate the impact, so you lose weight without setting yourself up for injuries. Every time you walk and put your foot to the ground, you are met by an equal and opposite amount of force applied by the ground on you body (foot); ground reaction force (impact). 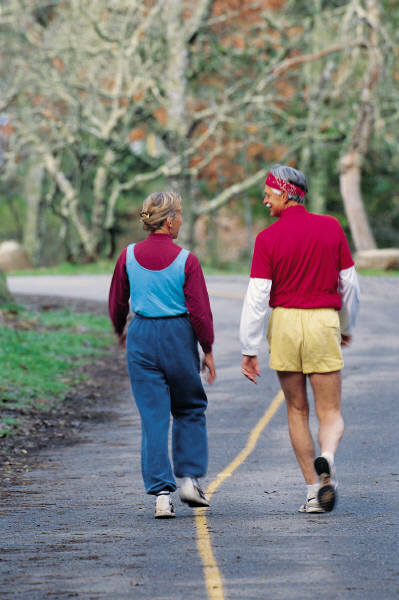 During walking the impact corresponds to your body weight times 1-1½. During running the impact is increased and is now 2-3 times your body weight – perhaps even more depending on the running technique. If your body weight is 150 pounds, the impact may be around 450 pounds! The heart and muscles handles this fairly easily, while the bones, joints and tendons need time to get stronger for this. Very short runs, short total running time, for the first 2-3 months. If you want more, add more walking and other exercise modalities. 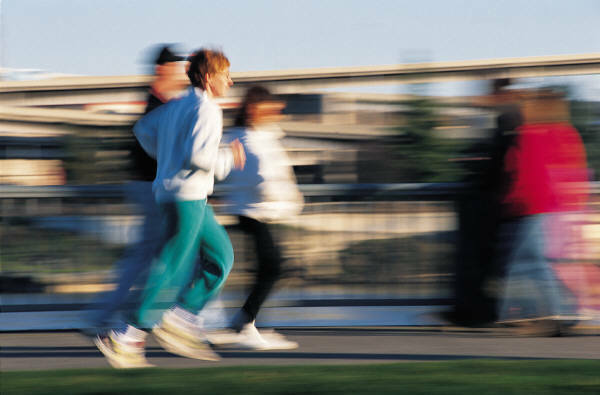 Recreational exercisers should increase their running by a maximum of 2-5 % per week! Interval running means ‘running in periods’, that is a ‘work period’, when you exert yourself and an active ‘rest period’, when you take it easy and restore you energy levels. Start by running for very short intervals initially. Warm-up by walking 5-15 minutes. Run for 5, 10, 15, 20 or 30 seconds and then a rest-pause of 2-4 times that duration. Repeat. Many, many beginning running programs recommend longer work periods than that, 2-3+ minute intervals. Do you feel lucky? Evidence point to the fact, that way too many ‘run-for-weightloss-runners’ suffer overuse injuries from that type of interval programs. Note, a great many running programs out there are designed by young, male, slender, fit, eliterunners, who – in spite of ample physiological knowledge – may have some difficulty in understanding the special running needs of eg. a 50-year old overweight woman. Rest-pauses can be of short or long duration and this affects the result. After short work intervals the rest-pause duration normally is 2-4 times longer, than the ‘work’, the running. Most importantly in running to lose weight, however, is to get going in the right way. Therefore your rest-pauses can be as long as you need to recover and get ready … not so long, though, that the rhythm and flow is lost! Interval running is fun and motivating, but hold back a little, when first starting out, so you do not wear yourself (and your tendons) out … Limit the total running time for the first couple of weeks, run no more than 2-3 minutes per run (if you are overweight). 12 x 10 second run + 20-50 second rest-pause (or longer). Do a warm-up first. 8 x 15 second run + 30-45 second rest-pause. 4 x 30 second run + 1-2 minute rest-pause. Three days of running per week with a day off between running days is a good choice initially. If you want to exercise more, then add spinning, cycling, nordic walking, rowing, svimming and cardio (exercise using cardio machines at home or at the gym, eg. crosstrainer training) on your days with no running. These exercise modalities supplement running well and have lower impact forces. If you are not too keen on systems and time-keeping, then the method ‘fartlek’, which are irregular intervals, may be just the thing for you: Do little ‘sprints’, when you feel like it and have a rest-pause, until you are ready for a new sprint, eg. run to the lamp post and then walk to the next lamp post or the one after that. Or run downhill and walk uphill … or run uphill and walk down. And include some stair-walking or -running if possible. For motivation enjoy the sounds of nature (and the smells) – be present in the ‘now’ – enjoy mindfulness. You can also listen to music. Find the music, that motivates you the most, preferably in a relatively fast tempo suitable for running. Make running a habit: Make an appointment with yourself, eg. run monday, wednesday and friday. Keep your appointment, let nothing get in the way. Make it easy. Have your running shoes and clothes ready, so they are right in front of you, when you get out of bed or return home from work or school. Some people like running on their own, others prefer to have a running partner. Whatever your preference, it is normally a wise move to team up with a running partner – at your own fitness level – so you have some company; even if you are not talking, it is motivating. Join a running club. Or have a dog, friend or member of the family run together with you. 1) Warm up; first walk slowly, then faster and faster, for 5-15 minutes, before running. 2) Breathe deeply and regularly, laboured breathing and sweating is fine, but you should not be so out of breath, that running feels stressful or painful (the warm-up helps in preventing this). 3) Run ‘light-footed’ (as light-footed you can) and straight forward without bouncing up and down. ‘Fall’ slightly forward with a full-body lean, from heel to neck, land with all of the foot – not just the heel – and move the arms dynamically. 4) Cool down; do not stop abruptly after running; continue walking for 5-10 minutes, so the heart rate drops to the pre-run level. Stopping too abruptly may make you dizzy. 5) Stretch as needed: A few short stretches relaxes the muscles and mind and reduce tension in tight calf, hamstring and hip muscles. Follow the link below: A unique ‘running for weight loss’ program designed specifically for going from ‘heavy’ to light, while experiencing the joy of running and steady weightloss. Excellent site. A lot of useful info here. I’m sending it to several pals ans also sharing in delicious. And of course, thanks for your effort! Thank you very much for your input 🙂 – it is appreciated! Glad to be of service 🙂 – and a big thank you for commenting! Next PostNext Running for Absolute Beginners? Run This Way!